The larger the surface and the busier the area, the more effective it is. Plastic building covers can provide a great solution for temporary renovation (lasting for several months or years). A special feature of plastic covers is that it protects the city from dust, besides being much more pleasing to the eye than traditional building wraps. As opposed to classic outdoor advertising, the size of their surface can reach several hundred or even thousands of square meters, making the campaign and the brand eye-catching and memorable. Demand for special effects has been growing steadily. The most popular building wraps feature 2D or 3D special elements (eg. Nike ball, Nokia net). The technical breakthrough of the early 90’s enabled the hand-painted designs to be magnified in good quality. The graphic design could be printed out on 3.5-5 meter-wide strips and assembled together to form a single ad of several hundred square meters. 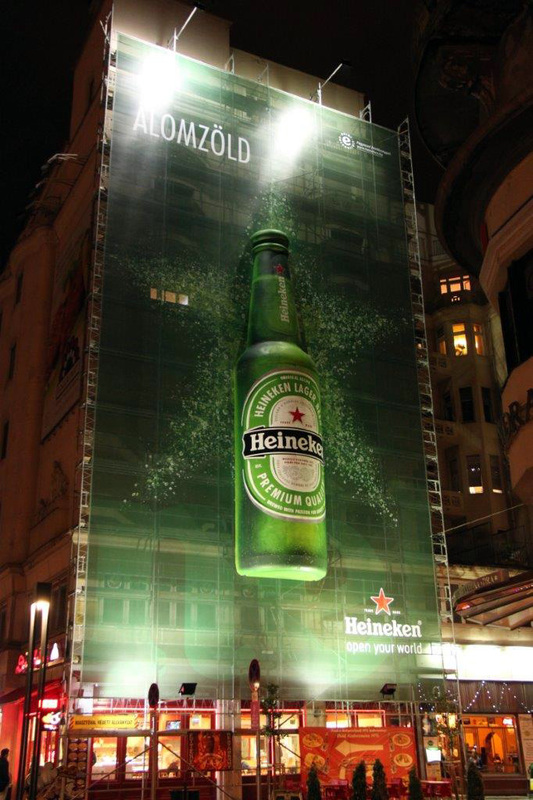 Should you be interested in combining building wraps with light advertising, please contact us for a unique offer.